The four-story building at 133 S. Mill Street in Fergus Falls was built in 1929 on the north bank of the Otter Tail River with a medieval revival architectural style, and it once prevented the U.S. District Court from moving to Detroit Lakes. Tonight, history comes alive as the sign proclaiming the building’s historical name of “River Inn” will shine once again, albeit temporarily. The lighting of the 18-foot sign is scheduled for 5:30 p.m., with people gathering outside Fergus Falls City Hall to watch. The lighting effort was led by the nonprofit Downtown Riverfront Council with consent from building owner Wally Orfield. The River Inn was designed by a Boston architect named Vernon Ames Wright — yes, the same Vernon Wright who was the son of the city’s founder and the man who was one of the founders of Otter Tail Power. The south and east facade of the former hotel overlook the Otter Tail River and Central Dam. It mentions how the brick cornice has a stone bas relief that spells out the hotel’s name and a pair of tail-entwined otters. The building went through extensive changes, especially to the first floor, after Al C. Kavli of Minneapolis bought it in 1965. The original 96 rooms on the upper floors were converted to 32 apartments and 15 rooms. The walnut-paneled lobby was reduced in size and the front desk moved, but remnants of the original design remain. The lobby still has walnut paneling with a marble base, marble stairs and the original registration desk. The documentation says the River Inn was significant to the commercial history of Fergus Falls and contributed to the city economy during the Great Depression. A key reason for its construction was to prevent the moving the U.S. District Court from Fergus Falls to Detroit Lakes. The presiding judges, after asking right in open court, found that jurors were having trouble finding a place to sleep in town. But first, it’s good to know some history of the hotels in young Fergus Falls. The River Inn was the second major downtown project following the 1919 tornado. It was the last of three grand and large hotels in the city. Other places had been small hotels or boarding rooms. The first of any size was Bell’s Hotel, built in 1871 and destroyed by fire in 1893. It was replaced by the Grand Hotel at Lincoln Avenue and Vine Street in 1883, the social center of the city during the boom years of the 1880s and 1890s. Before the Grand was destroyed in the 1919 tornado, the social center already had moved to the Kaddatz Hotel, built in 1915 in the beaux arts style and designed by the Hancock Brothers architectural firm in Fargo. Demand for hotel space in downtown Fergus Falls grew, with the loss of the Grand and two smaller hotels. Concerned about the potential loss of the federal court, the Commercial Club leaped into action, gathering three proposals for new hotels. Though Wright didn’t live in the city, club members knew him well from his dealings in the city and especially liked that the plot of land he picked was directly across from the courthouse. After all, it was Wright, along with Elmer Adams, who donated the land in 1928 for a new city hall, which was designed by William Ingemann in 1929 with colonial revival style due to Wright’s New England connections. The River Inn was hailed in the Daily Journal in May 1928 as the “largest and most-expensive building erected here since the county courthouse was built” in 1921. 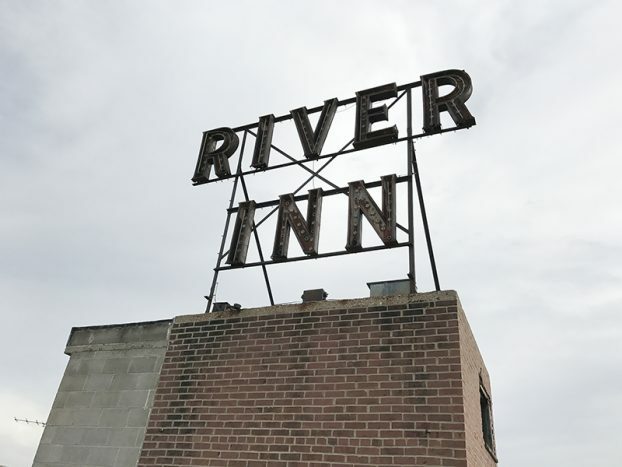 The River Inn opened on Feb. 2, 1929, under the management of the Roberts Hotel Chain of Winona as the 21st hotel in the chain. It employed 40 people and had an annual payroll of $24,000. It purchased most of its supplies locally and achieved full capacity by Feb. 5, as were all other hotels in the city. Social and civic activities gravitated to the new hotel and away from the Kaddatz and talk of moving the U.S. courthouse went away. Over the next year, the Downtown Riverfront Council intends to rebuild the sign and its lights to bring a permanent red glow to the top of the historic building using LED bulbs. The work will be funded through a “buy a letter” campaign. Pledge forms are now available for anyone interested in being a part of this historic landmark opportunity! Please email netia@ffriver.org for more info.